Until this point we haven't done anything drastic, now we will need to start taking things apart. If you are lucky and your two lenses are aligned properly than the is the only thing you need to adjust is the distance scale. It is an easy fix, and I will get to it later on, but to be honest you probably won't want to bother with it. 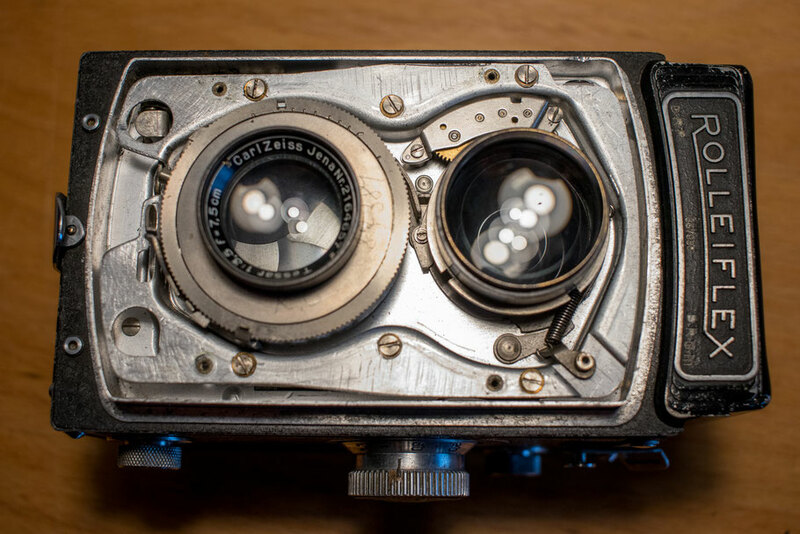 To align the two lenses it is necessary to remove the front cover of the camera. Set the camera to Bulb and wide open if it is not already, so the dials will align later when putting the cover back on. Start by removing the self timer switch on the top right corner. Use a pair of tweezers or something similar to slot into the groves and unscrew it. 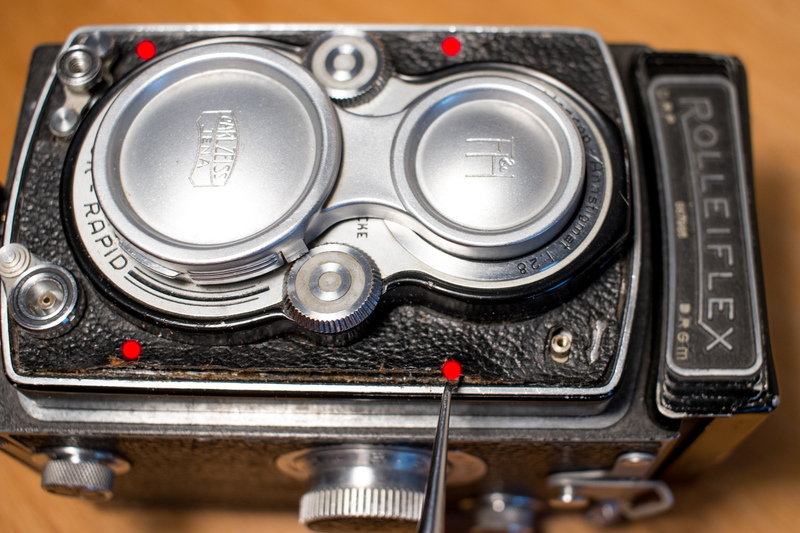 On my model, the shutter button, and flash sync port can be left in place. Next you will need to lift up the leather covering to access the four screws which hold the cover in place. I used a dental tool to gently lift up the edge of the leather, a little but of alcohol can also help loosen the glue and make lifting the leather easier. Once the four screws are loosened the front cover can be lifted up, but there are a couple things to watch out for. 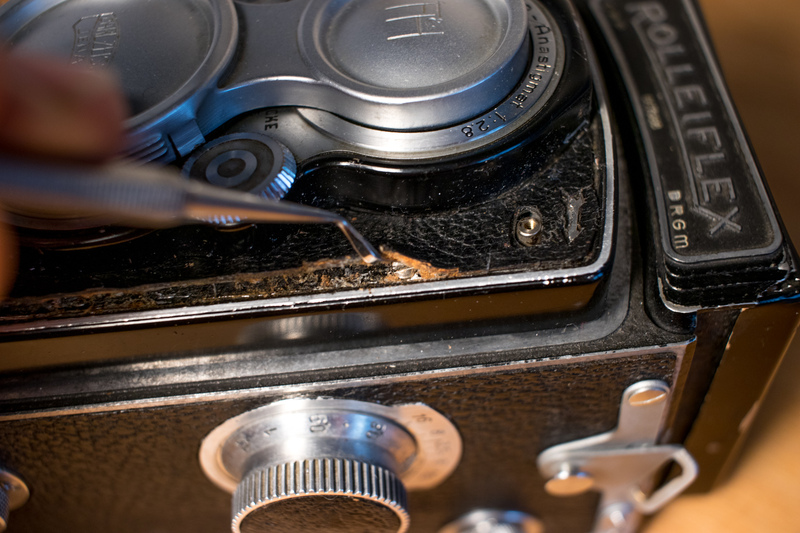 There will be a wire connecting the flash sync port to the shutter mechanism, it is screwed on with a non conductive washer between the wire and the shutter. 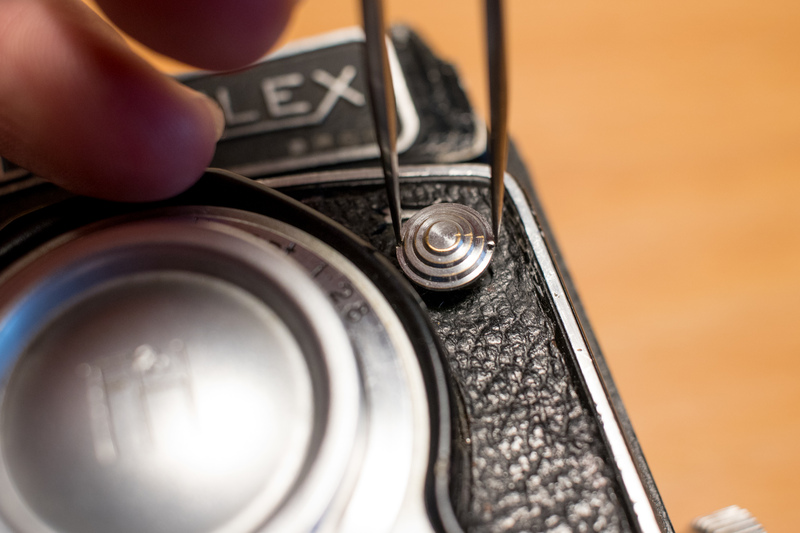 Remove the screw and be sure the washer doesn't fall down under the shutter trigger. Once the flash wire is removed you should be able to completely lift off the front cover. 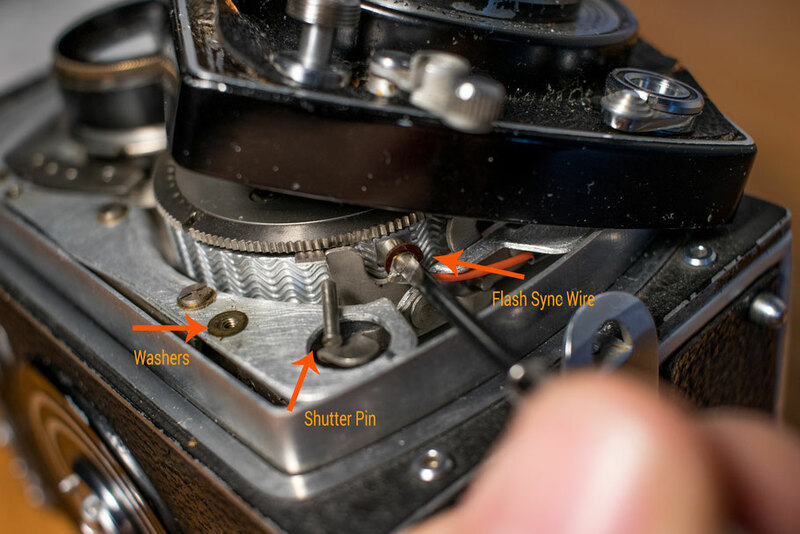 There may be one or more thin brass washers where each of the four screws were holding down the face plate, they tend to stick either to the main body of the camera or to the face plate itself. Take note of how many washers are used for each screw so you can replace them in the same locations later. If your camera has a cable release built into the shutter button, there will probably be a pin inside which will fall out and hide under the table if you aren't careful. Congratulations, you can take your first good look under the hood.